INURED’s 2012 Annual Meeting, Haiti’s Recovery: Democratizing Access through Research and Policy, brought together Haitian leadership from the public and private sectors as well as international partners in fields ranging from health to security and Rule of Law. This year INURED shared what we have learned through our research and other initiatives and provided a platform for Haiti’s current and future leaders to share their vision for the nation’s recovery and long-term development with the larger aim of finding synergy and aligning our collective resources. Our hope is that this year’s meeting placed Haitian voices at the center of discussions about the nation’s future, making our collective investment in Haiti one that is sustainable and has lasting impact on every segment of society. 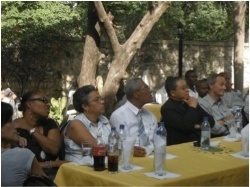 The Annual Meeting provided the opportunity to bring together international and local Haitian organizations and institutions in our continuous efforts to develop high-level research and scientific training in Haiti with the aim of improving the educational, socioeconomic and political condition of Haiti’s people. Various presentations and dialogue sessions took place over the course of the three-day meeting, putting these issues into context with the current situation in Haiti. This year has proven to be INURED's most exciting in its short yet diverse history. 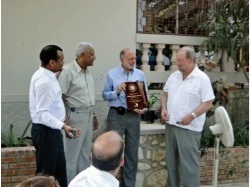 On Friday, June 8th, 2012 INURED, in collaboration with Professor Stephen Baranyi of the University of Ottawa and the Journal of Peacebuilding and Development, hosted "The Ambiguities of Cooperation for Rebuilding in Haiti” roundtable. The goal of the roundtable was to facilitate an evidence-based discussion on the strategies employed by key national and international actors in cooperative endeavors, their successes and setbacks. Attendees of the event included representatives from the Government of Haiti, members of the diplomatic corps, the private sector and academia. 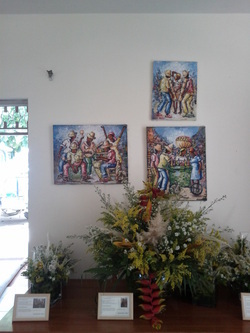 The event culminated with the official launch of the special issue of the Journal of Peacebuilding and Developmenttitled, "Cooperation for Reconstruction, Peace and Transformation in Haiti.” Among the five articles and three briefings in this issue is, "Cooperation, Peace and (Re-)construction? A Tale from the Shanties,” an article written by Dr. Louis Herns Marcelin that explores the skepticism of local residents in a Shantytown of Port-au-Prince regarding the potential for foreign, short-term development initiatives to generate peace and/or development in their community. On March 30, 2012, INURED facilitated a roundtable discussion of sustainability and collaboration in post-disaster Haiti at the 2012 Society for Applied Anthropology (SfAA) Annual Meeting in Balitmore, Maryland. Participants of the roundtable discussion included: Dr. Louis Herns Marcelin, Chancellor; Carolyn Rose Avila, member of the Board of Trustees; Alpen Sheth, International Partnerships Coordinator; and Toni Cela, Country Coordinator. Dr Bryan Page, member of INURED’s Scientific Board and Chair of its IRB, served as the discussant. The three sub-topics examined during this presentation included: higher education; land rights and tenure as well as community building in Camp Corail. The roundtable included a spirited discussion with several practitioners and academics regarding the role of the government in creating policies that are context-specific, responds to the needs of the population, sets the parameters of stakeholder engagement across sectors and how government leadership can help to better shape and guide NGO engagement in Haiti. Funded by VIVA RIO this innovative qualitative study examines social perspectives on the organization of the market for water in Bel Air. This study maps the distribution and sales networks for water and how communities access water on a daily basis. This study also considers the perceptions and incentives that individuals have concerning interventions by the Haitian government and international aid agencies in the region. In 2011, the Brazilian Cultural Center served as a site for day-two of INURED’s Annual Meeting activities. With its open-air auditorium and numerous meeting spaces, INURED was able to host over 150 participants and to facilitate breakout sessions for intimate discussions between researchers, public officials and practitioners.